Quick overview The VSG2260 is a L2+ managed switch designed for small to medium sized businesses. To cater for high bandwidth traffic, it is equipped with 20 Gigabit Ethernet ports for the LAN side, and 6 Fast Ethernet SFP ports, 2 of which are for fiber and the other 4 can be used for either UTP (Ethernet cable) or SFP (fiber) connections, for the backbone side. It has security features to meet the needs of managing local and remote access to the network. Furthermore, it has VLAN capability to allow flexible network design, and QoS capability for flexible bandwidth control. It supports 802.3az energy saving standards, sFlow network monitoring, IPv6 and IPv4 and many other functions. 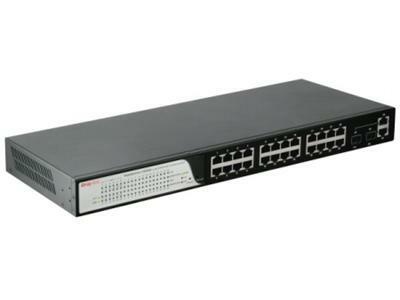 With preset options for configuring network devices and plug and play features,G 2260 switch is truly an ideal solution for business grade network infrastructure.